Come Saturday 23 September the NSW North Coast will be buzzing with the biggest garage sale day of the year as bargain hunters get amongst the fun of Second Hand Saturday. Without a doubt, two of the most excited treasure hunters will be dirtgirl and scrapboy who are busy packing their bags to head to the North Coast for Second Hand Saturday. 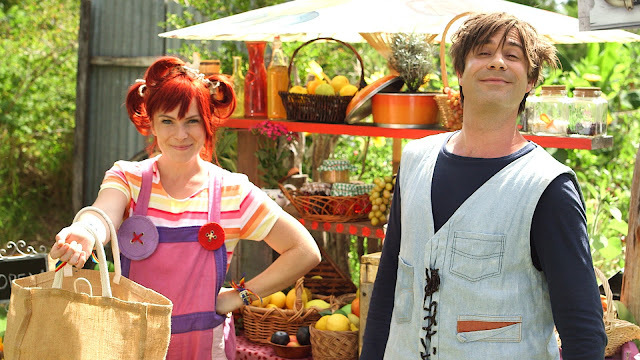 With the brand-new series Get Grubby TV now screening at 8.20am each day on ABC Kids and iView, you might think the stars of the show would be too busy for a big day out at the garage sales! Not so for this grubby gang of planet lovers who will be exploring the garage sales in the Clarence Valley and Tweed Shire. Both dirtgirl and scrapboy will be posting live updates on the dirtgirlworld Facebook page as they explore the garage sales on Saturday 23 September. With wish lists including an old chandelier and a rain gauge, who knows what they will find to take back to dirtgirlworld! Planet loving dirtgirl herself will be visiting the garage sales in the Clarence Valley. “This will be my first time at a garage sale and I’m really excited, even though I am wondering how I will fit a garage in my reusable shopping bag…just kidding!” says dirtgirl. 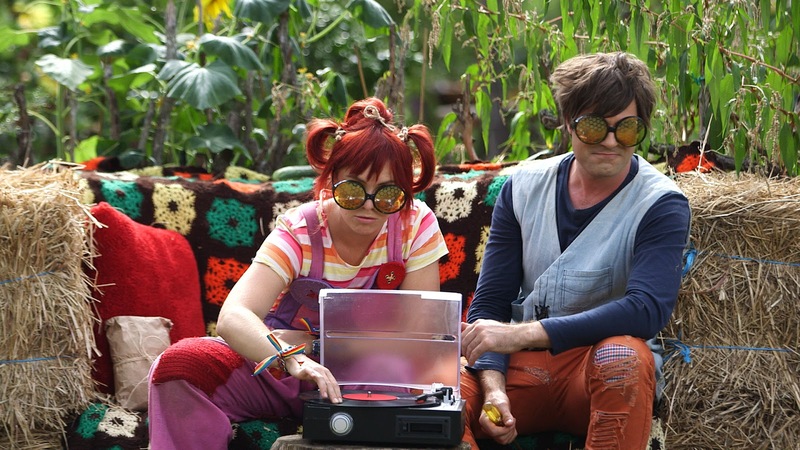 It’s not just dirtgirl who is looking forward to the biggest garage sale day of the year. Her best friend scrapboy will be looking for all sorts of weird and wonderful treasures in the Tweed Shire. “I’m a big believer in second hand, in fact I only ever buy or collect second hand stuff. Pretty much everything we make is from other people’s throw outs or spring cleans. I made the ‘scrapellite’ and the juicer, the washing machine and the flying fox from things we got second hand!” says scrapboy. • The Hobbit – a great book! To join in the Second Hand Saturday fun, be sure to visit the garage sales in your local area across Ballina, Byron, Clarence Valley, Kyogle, Lismore, Richmond Valley and Tweed Shire on Saturday 23 September. A leftovers garage sale day will also be held on Saturday 30 September. The list of garage sales across the North Coast will be available in your local paper from Monday 18 September and here on our website (which includes any late-registrations who didn’t make the print deadline) from Thursday 21 September. To help you plan your garage sale big day out you can also download the handy new app from App Store or Google Play. Registrations will go live on the app from Thursday 21 September. Follow the Second Hand Saturday Facebook page and be sure to let us know if you spot any items on dirtgirl and scrapboy’s wish lists on Second Hand Saturday! Roll up, roll up! Second Hand Saturday is on again on Saturday 23 September across Ballina, Byron, Clarence Valley, Kyogle, Lismore, Richmond Valley and Tweed regions. It’s the biggest garage sale on the north coast and a chance for you to turn your trash into treasure. A ‘leftovers’ day will also be held on Saturday 30 September so you get double the chance to sell your stuff. Register online to hold a garage sale and we’ll promote it for free in local newspapers, online and in our handy Second Hand Saturday app. It’s free to register and you’ll also be able to pick up a free garage sale sign from your local Council in the weeks leading up to the big day. With over 1,000 garage sales at last year’s event and hundreds of shoppers on the hunt for a bargain, this year is set to be bigger than ever. Jump on the bandwagon and make reuse and recycling fun! Swap your clutter for cash – Second Hand Saturday is a great excuse to have a big spring clean and de-clutter the house. Why hoard all those unused and unwanted household items when you could sell them and put the money to good use? Clothes, furniture, kitchen items, toys, books and more … you’ll be surprised at how many things could be given a second life in a new home. Raise money for your local club – A giant garage sale is a fantastic idea for an annual fundraiser. It’s also an opportunity to get together and show off your team spirit as part of this fun community event. With free promotion across the north coast, don’t miss your chance to raise funds and spread the word about your cause. Help the environment – With millions of tonnes of waste being sent to landfill by Australian households each year, holding a garage sale is one of the best ways that you can join the war on waste. Avoid a trip to the tip and let someone else breathe new life to your old treasures. Together we can lead the way on reuse and recycling across the North Coast! Let’s do this! "Thank you for organising this great event! We sold a lot, but we really enjoyed the social aspect and meeting different people." " The unified approach and the brilliant and colourful advertising made me feel like I was part of something special. It was great to be spreading the reuse message and promoting less waste to landfill." "We got rid of a lot of stuff and there were plenty of people out looking at all the garage sales." It’s free to register to hold a garage sale. Register online now! You’ll get free promotion and advertising in local newspapers, online and in the Second Hand Saturday app. You’ll be doing your bit to reduce landfill while being part of a fun community event across the whole of the NSW North Coast.